EPDM roofing is becoming increasingly popular in both commercial and residential properties, find out more about the benefits and cost of EPDM here. There are many homes in the UK that their food is either completely or partially flat. Even though this typeof roofing used to be popular in the past and might still be, it has many drawbacks. If you live in a house where more of the 40% of the total roofing area is flat, then you might have a hard time finding a standard insurance cover. However, thank to new technology, you do not have to worry more about having a flat roof, as EPDM has came to revolutionise the roofing market. What is the benefit of EPDM roofing?EPDM stands for Ethylene Propylene Diene Monomer; it’s a type of thermoset membrane. 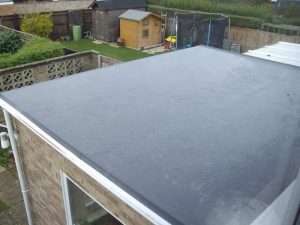 An EPDM roof is a single-ply rubber membrane, which is around 50mm in thickness and is normally used on flat roofs. You can buy it in rolls, which can be as wide as 50 feet, though most rubber roofs require much narrower EPDM materials. This type of roofing is usually black, although EPDM can have pigments or dyes added to it to make it lighter, which can help to keep the building cooler by reflecting the sun’s rays. Like other rubber roofs, EPDM roofs are very lightweight. EPDM is very easy to install. It is very effective at keeping a roof watertight. Has a very long lifespan. EPDM roofs don’t need much maintenance. It is a flexible material which can be installed on any type of roof whatever shape or design it is. When roofs become damaged by punctures or tears, they can be patched up easily. What are the disadvantages of EPDM roofing? It has to be said, they are not the most aesthetically pleasing roofs. Whilst you can do a DIY job, EPDM manufactures suggest professional installation, which can bump the cost up. Changes in weather mean that rubber can crack or shrink. Poor drainage systems can lead to the roof leaking. EPDM is glued to the roof deck using special roofing adhesive. Mechanically fastened rubber roofs are then attached using nails to screw along any loose edges of the material. Loose-laid systems are fastened only around the perimeter and are coated with gravel to help weigh down the loose-laid sections. All rubber roofs including EPDM roofs are bonded together via a cold applied tape and primer system to ensure that they are watertight. What sort of roof is EPDM best for? EPDM rubber is best suited for flat or at least low-slope roofing structures. This is because it is bonded at the seams with heat, to create a continual barrier, meaning it is far more watertight then shingles or rolled roofing options. Rubber roofing also helps to protects houses from wind and other harsh forms of weather. How Long does EPDM roofing take? If you want to get a good understanding of how long the project will last, you will need to ask your roofer for a breakdown when quoting. Furthermore, plan roof replacement work can be done easier during the summer days, as the days are warmer, longer and brighter. A small job such as a single storey extension usually take a day. Replacing a three bedroom house roof, takes nearly a week but if the beams and joists need replacing too, it could take as long as three weeks. Expect to pay anywhere between £6- £8 per square foot for labor and materials. However, the average price ranges between £5.50 – £6.50 per square foot. Rubber roofing contractors tend to charge between £8 – £16 per hour on top of materials. Rubber roofing refers to a single ply roofing systems that are made using thermoplastics such as TPO (Thermoplastic Polyolefin) and PVC (Polyvinyl Chloride). Thermoset EPDM is the most popular material used for both re-roofing and low slope roofing applications and is made of actual rubber. Thermoplastics and thermosets can both serve the same purpose, despite being made from different materials. The choice of material will increase slightly the cost. Consider carefully the weather conditions that your roof is being exposed to determine the thickness and type of the material, that best suits your needs. The thickness of roofing membranes is measured in millimeters and can range anywhere from 40-90 mils. If you are not sure always consult with a professional roofer before moving on with your project. EPDM roofs are often criticised because they cost more than felt flat roofs, as EPDM is more expensive material on a per metre squared basis. Also, when you are replacing your roof, roofers will give you a quote based on the size of the roof, the labour, materials and the cost of scaffolding hire. The cost of EPDM roof will also depend entirely on where you live and which roofer or roofing company you will choose. But roughly, you can expect to pay around £60-£80 per square meter for a professional roofer. You can buy a EPDM kit yourself for around £600-£800, or you can buy just the EPDM material at around 8£ -£10 per square meter. Whilst it may be tempting to save money by doing the job yourself, think of the longevity of your roof, it will probably have a longer lifespan if fitted professionally. Which EPDM system is more cost effective? Even though it has been suggested that the Firestone RubberCover is the cheapest EPDM system on the market, this is not correct according to our research. The cost appears to be low because most retailers/stocklists do not comply with the manufacturer’s correct usage instructions and suggest using less amount per square metre. This product comes with a 30 years BBA certification for 150m2 domestic roofs, when the correct amounts is used and the cheapest option costs around £9.75 + vat for 1.3 litre. So apparently, it is not that cheap. Bellow we compare the cost of various EPDM systems to help you choose the cheapest one. When planning to install EPDM roofing, you should always ask at least 3-5 quotes from professional roofers not only for saving money but also for finding the most experienced ones for the job. Roof slope: If water resides on your roof, there is probably something wrong with the slope. This is not something that the contractor cannot fix, however, it will increase the installation costs. Insulation: When it comes to EPDM roofing insulation, there are many different options to reduce heat loss. One option is to install a layer of insulation material first. Another option is the installation of rigid insulation boards from the outside. Sometimes it might also be necessary to apply an intermediate layer. Installation method: The method that will be used to install the rubber roof also affects the overall project cost. For example, if you choose to install your EPDM roof by mean of a ballast layer, this will incur additional costs. Warranty: You can come to an agreement with roofing company upon a period of guarantee. This is something that many companies/contractors are willing to offer. However, you need to pay attention to the terms and condition, so that you know that you warranty covers (damage cause from leaks, insured value etc. ).